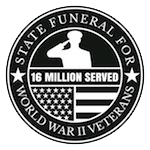 The following organizations have endorsed our efforts to encourage the President of the United States to designate a single State Funeral for the last Medal of Honor holder from World War II, as a final salute to the 16 million men and women who served in World War II. We need the support of your business or organization, as well. Please send us an email at info@worldwar2salute.org, or call us at (214) 534-8000 if you are interested.